Today I have a sympathy card to share with you. I used the Stampin' Up Simply Sketched hostess set. 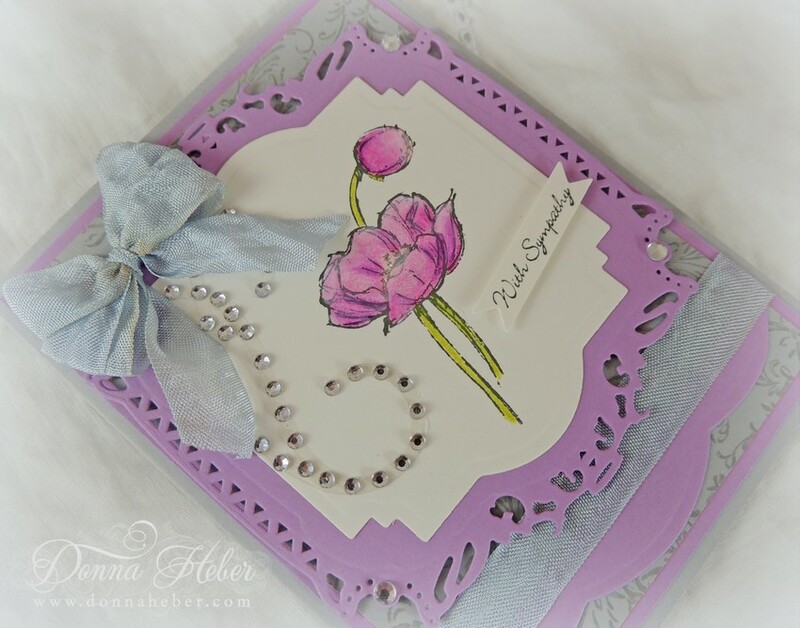 The card base is Smoky Slate layered with Orchid Opulence with another piece of Smoky Slate. I decorated the background paper by stamping the Filigree background with Smoky Slate ink. The flower image was stamped in StazOn Stone Gray onto a piece of Shimmery White paper cut from a Spellbinders Labels Twenty-Two #4 die. It was colored with Prismacolor pencils with Gamsol. I then mounted it to a piece of Orchid Opulence cut from a Decorative Labels Twenty-Two die. I added Diamond Stickles and clear rhinestones as a finishing touch. A strip of Orchid Opulence graces the bottom. It was cut using the Scalloped Borders Two die and edged with a piece of seam binding. The banner was created using the Framelits Bitty Banners and stamped With Sympathy in StazOn Stone Gray. A triple loop bow was made from Skies Over Versailles tea stained seam binding. I purchased about 10 yards last year from a shop on Etsy. The inside sentiment and image were stamped in StazOn Stone Gray. Prismacolor Pencils were also used for the leaves and berries. 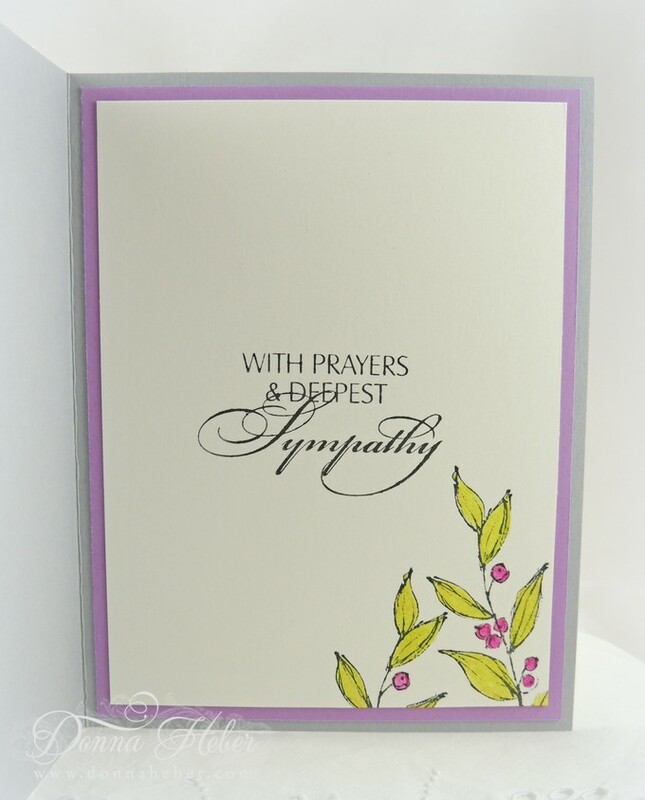 I don't usually have sympathy cards on hand and create them specifically for the individual. Although sometimes I feel like the card is going to be late by the time I mail it. You know how that goes! Thank you for stopping by. I hope you're enjoying the first days of summer. Stamps: SU Simply Sketched, Teeny Tiny Wishes, Filigree Background, Cathedral Sympathy by My Sentiments Exactly! Beautiful card, Donna! Love the colors! its a beautiful card Donna. Wow, wow, wow! I love your bow, and the ribbon strip near the bottom. The rhinestones look amazing, as does your entire card. It's just beautiful! Have a wonderful day, Donna. This is a really beautiful card, Donna. Someone will surely appreciate this very much. Donna what a beautiful sympathy card. Love the colors and the edging of the card. What a beautiful card for such a sad occasion.